Jeremiah Chapter 35 Star Chart: From 649 B.C. when the Rechabites (Cancer ear) HEAR and "OBEY their (Orion) father's commandment" (35:14) saying, "We will drink no (solar red) wine: for Jonadab the son of Rechab our father (Orion) (red radius line) commanded us, saying, Ye shall drink no (solar red) wine, neither ye, nor your (Gemini) sons forever: Neither shall ye build (red radius line) house, nor sow (solar red) seed, nor plant (green Milky Way) vineyard, nor have any: but all your days ye shall dwell in (red radius line) tents; that ye may live many days in the land where ye be strangers. Thus have we OBEYED the voice of Jonadab the son of Rechab our father (Orion) in all that he hath (red radius line) charged us, to drink no (solar red) wine all our days, we, our (Gemini) wives, our (Gemini) sons, nor our (Gemini) daughters; Nor to build (red radius line) houses for us to dwell in: neither have we (green Milky Way) vineyard, nor (red radius line) field, nor (solar red) seed: But we have dwelt in (red radius line) tents, and have OBEYED, and done according to all that Jonadab our father (Orion) (red radius line) commanded us" (35:6-10) TILL "Nebuchadrezzar king of Babylon came up into the land" (35:11) (604 B.C.) when "the (Gemini) men of Judah and the (Gemini) inhabitants of Jerusalem" (35:13) "(Cancer ear) HEARKENED NOT unto me" (35:14) your heavenly Father is 45° years. 5 And I set before the (Gemini) sons of the house of the Rechabites (solar red) pots full of wine, and (lunar empty) cups, and I said unto them, Drink ye wine. 7 Neither shall ye build (red radius line) house, nor sow (solar red) seed, nor plant (green Milky Way) vineyard, nor have any: but all your days ye shall dwell in (red radius line) tents; that ye may live many days in the land where ye be strangers. 10 But we have dwelt in (red radius line) tents, and have obeyed, and done according to all that Jonadab our father (Orion) (red radius line in 649 B.C.) commanded us. 11 But it came to pass, when Nebuchadrezzar king of Babylon came up into the land (604 B.C. ), that we said, Come, and let us go to Jerusalem for fear of the army of the Chaldeans, and for fear of the army of the Syrians: so we dwell at Jerusalem. 13 Thus saith the Lord of hosts, the God of Israel; Go and tell the (Gemini) men of Judah and the (Gemini) inhabitants of Jerusalem, Will ye not receive instruction to (Cancer ear) hearken to my words? saith the Lord. 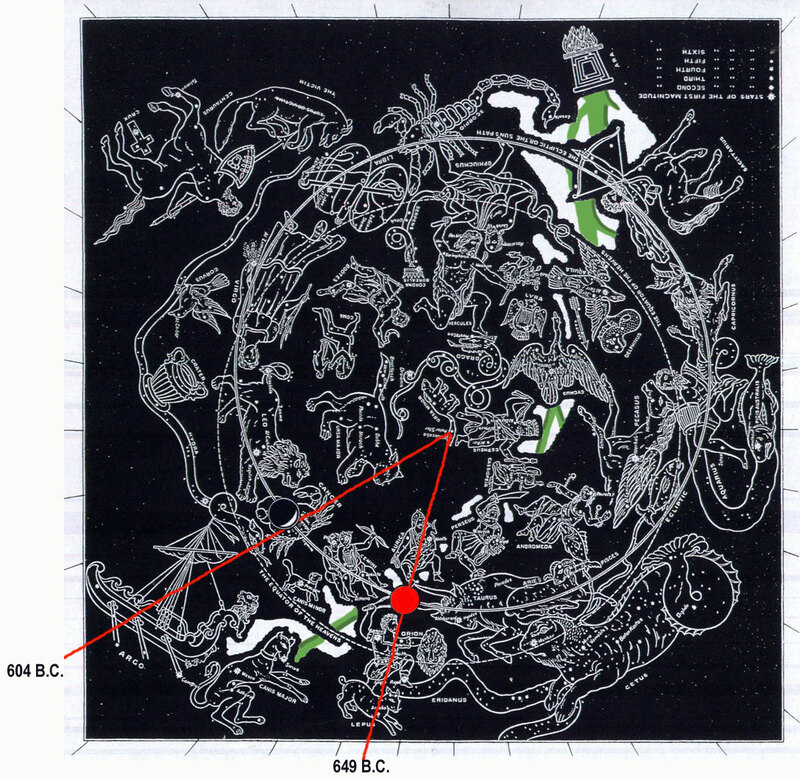 14 The words of Jonadab the son of Rechab (Orion), that he (red radius line in 649 B.C.) commanded his (Gemini) sons not to drink (solar red) wine, are performed; for unto this day they drink none, but obey their father's (red radius line) commandment: notwithstanding I (Orion) have (red radius line in 649 B.C.) spoken unto you, rising early (sun on horizon line) and speaking; but ye (Cancer ear) hearkened not unto me. 15 I have sent also unto you all my (Gemini) servants the prophets, rising up early (sun on red radius horizon) and sending them, saying, Return ye now every man from his evil way, and amend your doings, and go not after other (Gemini) gods to serve them, and ye shall dwell in the land which I have given to you and to your (Gemini) fathers: but ye have not inclined your (Cancer) ear, nor hearkened unto me. 17 Therefore thus saith the Lord God of hosts, the God of Israel; Behold, I will bring upon Judah and upon all the inhabitants of Jerusalem all the evil that I have pronounced against them: because I (Orion) have (red radius line in 649 B.C.) spoken unto them, but they have not (Cancer ear) heard; and I have called unto them, but they have not answered.